Was there an explosion of "hate crime" after the Brexit referendum? Hate crimes probably did increase, but by much less than the often hysterical media coverage would imply. Following the vote to Leave the European Union in June 2016, there has been a deluge of reporting about a steep rise in “hate crimes”. But are hate crimes actually on the rise? Actual, “real” hate crimes have almost certainly risen since the referendum result. But by smaller numbers than typically reported in the media. The definition of a “hate crime” is problematic as it requires literally no evidence or justification. It is based on “perception”, and of the 25% of hate crimes that are prosecuted, actual “hate” is not proven in court 66% of the time. The large increase in recorded hate crime is likely “predominantly” driven by increased awareness of methods to report hate crime - as well as proactive encouragement of certain communities and groups to report such crimes, and less acceptance of perceived hate crimes, leading people to report crimes they may have ignored or tacitly accepted beforehand. Political bias negatively skews almost all discussion of this hate crime spike. Die-hard Remainers are cynically exploiting it, whilst Leave campaigners are probably denying it too strongly. According to the Home Office (using data directly from Police forces), the number of Racial/Religious hate crimes* reported to the police in England and Wales increased by 40.71% immediately after the EU referendum. *Racial/Religious hate crime is the type that would target nationality and ethnicity, rather than age or sexuality, so would be the most sensitive to intolerance resulting from or caused by the Brexit vote. And the problem of hate crimes is now so bad, that three new dedicated online groups were set up after the referendum to track and encourage the reporting of hate crimes: PostRefRacism, WorryingSigns and iStreetWatch (while a useful source of info, these should be treated with caution as none of these groups appear to carry out independent verification of claims or seem to retract reports that are later shown to be erroneous). Fact checking website FullFact also reported that the claim of a 41% rise in reported hate crime was true. This was based on reviewing the Home Office data and concluding that a rise in underlying real hate crimes was likely, whilst noting there was little or no research into the causes of this increase. And a PhD student at the University of Southampton carried out a statistical analysis on the data and also concluded the spike was real, with almost certainly more actual hate crimes. However, there are some reasons to be wary of concluding that this spike in reported hate crime after the Brexit vote is due to substantially more actual hate crimes being committed. What is a “hate crime”? This COP Operational Guidance on Hate Crime is also a continuation of a policy from 2005 in the National Standard for Incident Recording rules which states: “evidence of an offence is not a requirement for a hate incident to be recorded … there is no evidential test as to what is or is not a hate incident”. “Perception by anyone” is “all that is required” (and anyone can be a police officer, rather than the victim or witnesses). Taken literally, any straight person verbally abused walking through Soho in London who reports this to police might well have a homophobic hate crime recorded if there happen to have been any homophobic crimes in the area. And I suppose any verbal abuse of a black man in any area where there was previously racist abuse of black men would fall into the same category, even if the black victim didn’t feel the incident was racist at all. There are quite a few reasons to keep an open mind about whether this spike in reporting means more actual hate crimes. Reason 1: A number of commentators doubt hate crimes have actually risen at all. And a major police force doubts any rise is linked to Brexit. However, it is unlikely Essex Police hold any political bias about Brexit, and they also denied any link between Brexit and an increase in hate crimes. Why have such vague definitions of hate crimes? Why have a policy explicitly not requiring any evidence? Why discourage Police Officers from using their own judgement to question victim “perceptions”? Rather than some kind of conspiracy, the most benign (and likely) reason is the results of the Crime Survey of England and Wales (CSEW). Similar to a census but for crime, the CSEW carries out face to face interviews with households every two years, asking them about their experiences of crime. CSEW figures state that there were 222,000 hate crimes a year on average in 2012-2015 (the number of hate crimes has actually fallen from 278,000 in 2010-2012). As only between 42,000-58,000 hate crimes were reported/recorded by police in that same period, hate crimes are “under-reported”. This means that all Police forces in England and Wales are specifically directed to improve - which always means increase - the number of hate crimes reported, until they converge with the CSEW. It is not clear exactly how the CSEW is confident that its hate crime figures are accurate given a “perception” based crime would be unusually sensitive to some of the known drawbacks of the CSEW (see ONS Table 5) - as say, compared to a victim of car theft. Perception really isn’t the main factor there - your car is either still on the drive or it isn’t. Also according to Home Office crime statisticians ('Limitations of the CSEW questions'), “the CSEW does not ask about hate crime directly as the concept is not well understood by the public and is likely to lead to mis-reporting”. Instead, they are asked to speculate on what they think the perpetrators motives might be, which “may result in some over-reporting”. In addition, respondents to the CSEW stated that 48% of hate crimes “came to the attention of the Police”, a higher rate than ordinary crime, and this would mean 106,000 hate crimes being reported - yet only around 44,000-62,000 were actually recorded by the Police in the same period. Hate Crime is also very low volume in the CSEW (<3%), has a “large margin of error”, and isn’t “sufficiently robust” to report on an annualised basis, with multiple years added together to form an average. Despite these drawbacks, the CSEW is the sole basis for concluding that Hate Crimes are “under reported” and therefore the Police and wider society must encourage more and more reporting of Hate Crimes. The Crime Survey of England and Wales (CSEW) does not yet cover the period post-Brexit referendum so cannot yet be used to check for any "spike"
The Police themselves took a nuanced view towards blaming Brexit for the spike in hate crime when questioned during a hearing in Parliament on Hate Crime statistics in Feb 2017, as part of a Home Affairs Committee inquiry into Hate Crime launched in July 2016. Mr Hamilton also says that, “when you look at the type of hate crime offending that occurred post-referendum—this is by no means to diminish it—we use the expression lower-end”. Finally, it was emphasised in the testimony by Mark Hamilton that "[The UK is] far more robust, and we have a far broader, more accepting and encompassing view of hate crime and hate incidents in this country than anywhere else on the planet” (see Reason 6 for more on this, looking at Hate Crimes in Europe based on OSCE data). Less and less reported hate crimes are being prosecuted. 38.6% of racial/religious hate crime was prosecuted in 2013-2014 - this had fallen to only 25.8% by 2015-2016. Despite a steep rise in nearly 10,000 more reported hate crimes per annum from Apr 2013 to Mar 2016, there are only an additional 640 hate crime convictions. And even a conviction doesn’t mean a “hate crime” actually occurred in those 640 cases - according to the Crown Prosecution Service, “in any hate crime prosecution where the evidence of hostility has been accepted by the court and the defendant pleads or is found guilty”, a “sentence uplift will apply”. Note that legally, “hostility” is a much lower threshold than “hate”, and can include simple “dislike”. Despite that lower bar, such an uplift only applied in <37% of race/religious hate crime cases in 2015-2016, and 12% in 2014/2015. Also, much of this 640 increase in court convictions could be also attributed to population increase - the size of England and Wales went up by ~900,000 in that period, according to ONS estimates - roughly the populations of Manchester and Liverpool combined. Just like the overall spike in hate crime, this widening gap between reported and prosecuted could have multiple explanations. These could be more real hate crimes the Police simply aren’t referring to the CPS for prosecution - e.g. perhaps due to lack of resources, or different priorities (or being “institutionally racist” I suppose). 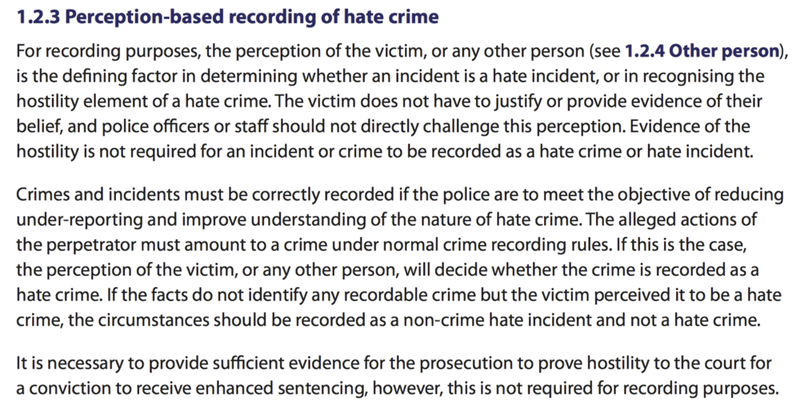 Or the number of mistaken/false hate crimes being reported could be increasing, in which case they are correctly not being referred to the CPS, as they don’t exist. Depending on your bias, you can assume the “victims” of this “explosion in hate crime” are being failed, the explosion is a mirage and there aren’t any more victims at all, or anything in between. According to a Google Trends search, “hate crime” was barely searched for at all on the web prior to the referendum result being announced (except during publicity campaigns like “Hate Crime Awareness week”). And Brexit wasn’t even mentioned in connection with “hate crime” until after the vote - after considerable publicity about hate crimes on major outlets like the BBC. This lends credence to the idea of increased awareness amongst the public contributing to additional hate crimes being reported. The UK tracking of hate crime is easily the “best” in Europe - according to the OSCE which collates figures across the continent. Compared to similar large countries like France, Germany, Italy, Poland, and Spain, the UK recorded dramatically higher levels of reported hate crime than all of them in 2015, in fact nearly nine times more than all of them combined (62,518 in the UK compared to 6,982). This doesn’t mean the UK actually has more hate crime, as looking at a country like Austria shows. In Austria’s OSCE figures, there were only 395 hate crimes reported for a population of 8.6m - that’s about 2,700 if Austria was the size of England and Wales. The largest political party in Austria today was founded by actual Nazis and opinion polls consistently show poor attitudes on race/Jews/migrants compared to the UK. Yet the UK has twenty two more hate crime than Austria? Is this credible? I seriously doubt it. If other European countries aren’t even taking hate crime seriously enough to record it, how are they more tolerant than the UK? It seems rather strange to criticise the UK for having high levels of reported hate crime when many others don’t even seem to bother. Unless of course, you think their stats are correct, so are ours, and this proves the case that the UK is actually intolerant. But this is not reconcilable with virtually any other opinion poll data or basic common sense. All of the data given above (and nearly 100% of media reporting) is based on data solely from England and Wales as Scotland does not participate in the CSEW, and has a different legal system and Police force. However Scotland does monitor and prosecute Hate Crime and provides its own bespoke online website for reporting Hate Crime. Along with the fact that England and Wales have a higher % of foreign born nationals than Scotland, this data point for me is persuasive that there really was an increase in underlying hate crimes after the referendum result, not just increased reporting of them. The definition of a reported Hate crime is problematic, requires no evidence, and most don’t end up being proven in court. Solely basing the fact that hate crime is “under reported” on the CSEW is at least questionable, given the low percentage of such crimes in the survey, the exponentially larger number of hate crimes in the UK compared to other comparable European states recorded by the OSCE, and the widening gap between reported hate crimes and prosecuted hate crime in the courts. Police experts on Hate Crime appear to believe increased awareness has “predominantly” driven a large part of the increased number of reported crimes, and this is supposed by Google Trends data. Media reporting of hate crimes is lacking, with political bias towards Remain or Leave negatively skewing coverage. The statistically large spike in reported hate crimes around the referendum result in England and Wales, alongside the lack of such a spike in Scotland, supports the theory that the true number of real underlying hate crimes in England and Wales almost certainly did increase in 2016. But - as I’ll show in a future blog post, the UK is still one of the most tolerant countries in Europe. It is a cynical use of real victims for political purposes to take this rise in hate crime to paint the entire UK as more “intolerant” overrun by a “wave” of “xenophobia” without mentioning this important context. Especially if the political objective is undermine Brexit, as the record of other European/EU states in hate crime or general intolerance is far worse.